Is this the R20 Thread you are looking for? I don’t think so. The last post on that was August 13th. The thread he is referring too had very recent posts and probably around 5, 10 (or more) pages worth of replies. What is going on. Agreed this is terrible. Recent posts not appearing and the layout is dire. Where is the best place for C4D talk these days? The font color and forum layout is hard on the eyes, thats for sure. 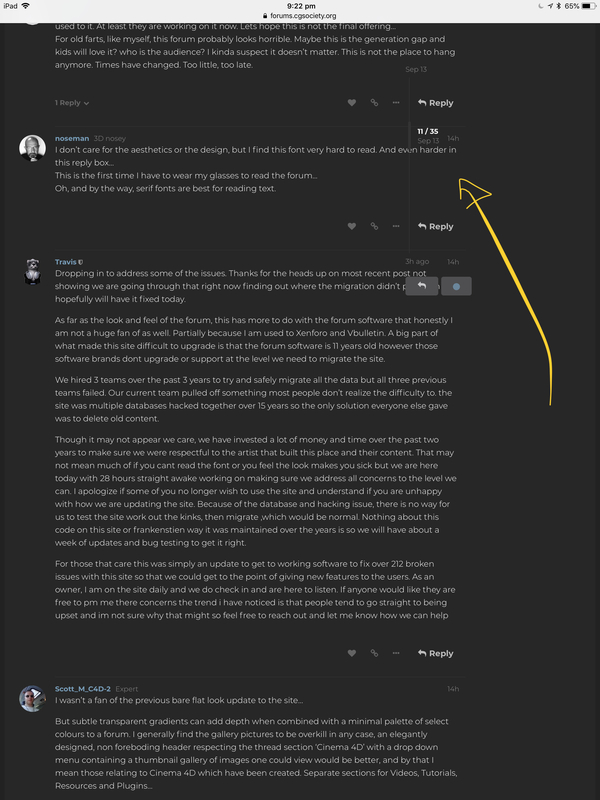 While the design is not my favorite and readability is worse, I am thankful that Travis and his gang were able to pull the Forum into the 21 century technology wise. From how i read this we might have a chance now for a maintainable forum and i am sure that once the technical problems are out of the way some time and money can be spend on improving the shape of things. As for subforums, be careful what you ask for. We had them for many years and they did not work out. Instead of helping to find things they were graveyards. It is always easy to get upset. And even thou there of course has to be room for critic. I thought in a 3D forum, with people that are used to work in preview mode for month before they see the result and with graphically educated people around, that should know, that the first impression on a layout might change quite a bit after looking at it for a while. I am a bit sad about the harsh critics , parts of which I find quite a bit unreflected. porting a big forum like this is not a easier or faster task then producing a 3d animation. You start with a animatic, that the customer is not able to read. And you get a unpleasent response about the look even thou the animatic was about animation of course. they have to get over the database of 10 years first, then they can take care about the design finetuning. After hearing from Travis, I feel much better about it. The assumption I made was that there had already been tweaks made and DB merged and all that before ever pulling the trigger to make it live. That’s why it concerned me, I figured we were stuck with it like this. He has explained that they are having to edit in live mode for technical reasons, so I feel things will get better soon. Missing threads will hopefully return. Especially with all the recent information on R20 and plugins etc. On desktop I can read the forum, although it is worse than before . On mobile (iPhone) it is completely unreadable; very narrow collumns of text with only 2 words on each line. Come on it’s 2018! What´s good is that Maxon is now placed first in software area. It´s cleaner but the cgsociety brand colors are gone. Autodesk is playing god? It is top of other threads and not in software area. Did Autodesk pay cgsociety to get special placement? I get better feeling about cleaner style versus cinema 4d cafe. Feels bit same. At least they scuttled those insufferable social media Sharing links. Mobile hasnt been addressed yet. I hope no one went on there and thought we did anything for mobile on purpose;) We do have mobile set up next but the first wave for us is to get data migrated correctly without lost to protect everyones info and accessible like the r20 thread that should be fixed today. Issues like font value spacing font etc are all easier to fix and worry about over the next few days. The search returns hits for the entire CGSociety. Can’t it be narrowed down to C4d like before? Glad to see you are hard at work to straighten things up. And really appreciate your feedback in this thread too. Good luck, and no doubt this will be a better place to be in when it’s all finished.